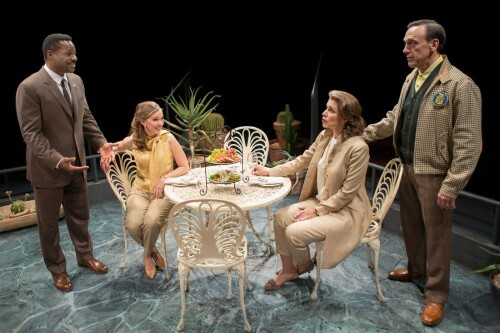 (L to R) Malcolm-Jamal Warner, Bethany Anne Lind, Tess Malis Kincaid and Tom Key in Guess Who’s Coming to Dinner at Arena Stage at the Mead Center for American Theater. Photo by Teresa Wood. For a play based on a film made in 1967, you might suspect antiquated dialogue and plotlines. While William Rose’s screenplay about Joanna Drayton (Bethany Anne Lind), a girl who surprises her family by bringing home an African-American fiancée (Malcolm-Jamal Warner), may have been edgy back then, the idea of inter-racial marriage is much more accepted in our society now. Well even in “post-racial” 2013, the idea of whites and blacks marrying each other is still making headlines. Todd Kreidler’s stage adaptation of Rose’s story still resonates with audiences in a new production at Arena Stage. The story may not provoke like it did back in the 60s; instead it serves as a galvanizing statement of equality and the way love should be. The crowd inside the packed Fichandler Stage was eager to give their stamp of approval against prejudice, exploding into applause anytime a character demonstrated against bigotry. The statement that the original film set out to make now has a strong rooting interest in 2013. The plot is contrived from the beginning: Joanna suddenly returns from Hawaii with her new soul mate: Dr. John Prentice. On top of the shock her art dealer mother (Tess Malis Kincaid) and liberal newspaper publisher father (Tom Key) are caught up with, they must also give a thumbs up or down to the marriage that night before Dr. Prentice leaves the country for work. Also caught up in the saga is the house maid Matilda (Lynda Gravatt), who is suspicious about the whole romance. While it seems like an arbitrary situation where everyone must come to immediate terms with Joanna’s relationship, director David Esbjornson deftly guides this ship on a straight and narrow path with audience in tow well past it. Rounding out the cast is an art gallery employee (Valerie Leonard), a Monsignor (Michael Russotto) who’s a family friend, and Dr. Prentice’s parents (Eugene Lee and Andrea Frye). Being the biggest name in the cast, Malcolm-Jamal Warner has certainly matured well since his days on The Cosby Show. As Dr. John Prentice, Warner puts his own spin on the role that helped put Sidney Poitier on the map. Warner disarms others around him as well as the audience with a smooth quiet smile all throughout the first act. In the second he really breaks out with his declaration that he is not a colored man, but a man. However it should be clear that Warner is only one piece of a solid cast. For Lind, Kincaid, and Frye this show is very familiar territory with all three having done the show last year for Atlanta’s True Colors Theatre. Much of the action goes through parents Key and Kincaid whose performances certainly rival Katharine Hepburn and Spencer Tracy in the film version. Guess Who’s Coming To Dinner may hark to a decade gone by, but its humorous approach will still entertain audiences and point to a future where we can perhaps look back and laugh at how things used to be. Guess Who’s Coming to Dinner performs at Arena Stage’s Fichandler Stage now through January 5th, 2014. Arena Stage is located at 1101 6th St SW, Washington DC 20024. Tickets $85. For more information, call 202-554-9066.